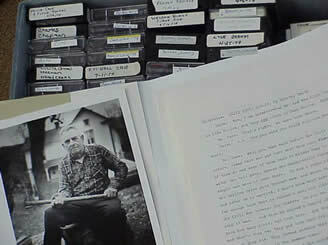 Records an interview with Cletus Waters, whose father owned a general store in the vicinity of Rocky Branch until 1928. Describes his father's business and his interaction with local mountain families. Mr. Waters' wife, Hazel, who is unnamed in the transcript, contributes to the interview. Distilling, Illicit -- Virginia – History; Mountain people -- Blue Ridge Mountains -- Social life and customs; Mountain people -- Virginia -- Shenandoah National Park -- Social life and customs; Rural poor – Virginia; Food habits -- Appalachian Region, Southern; Country life -- Appalachian Region, Southern; Agriculture -- Appalachian Region, Southern; Holidays -- Shenandoah River Valley (Va. and W. Va.) – History; Land use -- Government policy – Virginia; Blue Ridge Mountains -- Economic conditions; Merchants -- Virginia -- Rocky Branch – History. Blue Ridge Mountains -- Economic conditions; Page County (Va.) – History; Shenandoah River Valley (Va. and W. Va.) -- Manners and customs; Shenandoah National Park (Va.) -- History, Local. Marston, Sharon G.; Purington, Mark S.